Every cook has their “house vinaigrette”. It’s the dressing you make when there is nothing else available in the refrigerator or it’s just your go to, favorite way to dress your salad. I like tangy when it comes to dressing and this vinaigrette definitely delivers in that department. It’s a nice balance of flavors and works well with many types of lettuce and various salad ingredients. 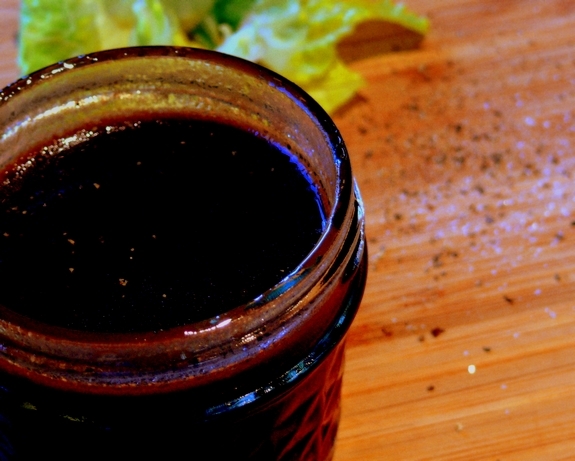 When making salad dressing such as this one, always use good olive oil and vinegar, it makes such a difference. Place all ingredients in a small mason jar with a lid and shake until well combined. This will keep in the refrigerator for four days. Thanks! I needed new life in the salad department. This is my standard recipe for vinaigrette. Try using a white balsamic vinegar (available at Trader Joe’s) for a different, milder taste. Everyone loves this on their salad. I make something similar. Must remember to add the dijon next time! Great minds… I just posted my own “house vinaigrette” last week. I leave out the garlic and add agave nectar or honey to balance the acid. I like that you also use a high percentage of vinegar to oil. Just got around to trying this one — perfect! I probably never would have thought to add the dijon mustard.